What Does Diabetes Mean for Your Feet and Ankles? Diabetes is a growing epidemic in our nation and beyond, with over 30 million cases in the United States alone. Unfortunately, diabetes and complications that directly arise from the disease can have significant consequences for your health, including the health of your feet. But what does that mean for you personally? That depends. On the one hand, we know the kind of damage diabetes can do to lower extremities, because we see it at our office every day. The two biggest systemic risks of diabetes for the feet are damaged nerves (known as peripheral neuropathy) and reduced circulation (called peripheral arterial disease). They can pose a devastating one-two punch. If your nerves aren’t working correctly, you may not be able to feel the pain of a cut, burn, or injury to tell you something’s wrong. And if your feet aren’t getting the oxygen and blood flow they need, sores can fester and get infected, rather than heal quickly. The end result of this combination? If you don’t seek treatment immediately, it could mean a complicated limb salvage operation or even a full amputation to stop the spread of infection. In extreme cases, people with diabetes can even develop severe foot deformity from unknowingly walking on broken or injured bones and joints, a condition called Charcot foot. On the other hand, a diabetes diagnosis doesn’t necessarily mean this will all happen to you! As a matter of fact, almost all diabetic foot complications—or at least the most extreme ones—are very manageable and preventable. 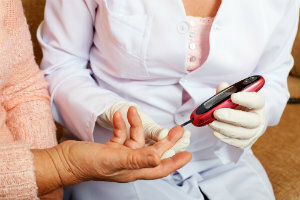 The core problem is uncontrolled sugar levels in the blood, and while those with diabetes can’t rely on their bodies to do this work for them, they can work hard to keep their glucose numbers as close to the target as possible. If you’re careful about managing your diabetes and live a clean, healthy lifestyle, your odds of avoiding neuropathy or peripheral artery disease (or at least delaying and slowing their progression) are quite good. By checking your feet every day for cuts and injuries, and checking in with us once a year for preventative screenings, you can catch those trouble spots before they turn into a bigger problem. What does diabetes mean for your feet and ankles? The truth is that it’s largely up to you! Be proactive and schedule your diabetic foot checkup with Martin Foot & Ankle today—you can reach any of our offices at (717) 757-3537.